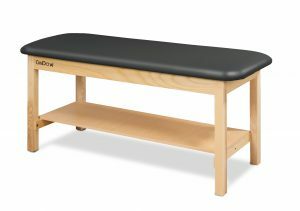 Earlier this week, we wrote about 3 important factors to consider when buying a treatment table. You should consider portability, durability, and size. Are you considering purchasing a treatment table to help your business? If you are, you should consider the CanDo® Treatment Tables. CanDo® Treatment Tables are designed and tested to offer work surfaces that are durable, rigid, and comfortable. The tables are fixed so they can hold up to 400 pounds. Thanks to their hardwood frames and high-quality hardwood legs, they are sturdy enough repeated use in a clinical setting for many years. These functional tables are available in several widths to fit in your desired area. CanDo® Treatment Tables also have different colored upholstered tops and wood finishes for a more custom look. You can choose from 5 different upholstery top colors and 2 different colored wood finishes. Each upholstery top is made of a heavyweight, knit-backed upholstery with 2-inch foam padding and has seamless rounded cornered edges. This 2-inch padding optimizes patient comfort. If you are looking for treatment tables, look no further than CanDo® Treatment Tables. To view our selection of treatment tables, click here.